The SON4 is a compact, high output, 104/100dB(A) alarm sounder with integral Xenon strobe or high output LED beacon. The robust fire retardant housing ensures the SON4 is suitable for all general signalling applications including fire, security and process control. – Sound output: 104dB @ 1m (xenon version) & 100dB @ 1m (LED version). – 10 tones (LED) or 32 tones (xenon) including ISO tones compliant with Australian Standards (see tone list in attached pdf). – Automatic synchronization on multi-sounder systems when connected to the same power supply. – Light Output: Xenon = 11cd(e); LED = 3cd(e). – Flash Rate: Xenon = 60fpm; LED = 120fpm or steady. – Volume control, (3 volume levels on xenon version). – Available in red or white. – Temp Rating (degrees C): -25 to +55. – Cable Entry: 4 x M20 knockouts. – Lens color available in: Amber, Blue, Green, Red (xenon version); amber & red (LED version). 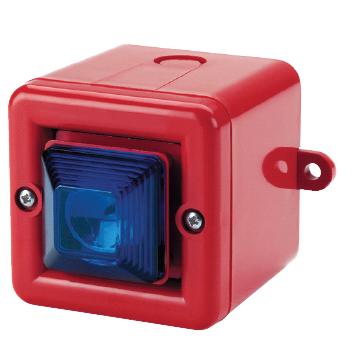 ESS0040RX Xenon beacon, red housing, 18-30VDC, 80-110mA, (specify color). ESS0040WX Xenon beacon, white housing, 18-30VDC, 80-110mA, (specify color). ESS0042RX Xenon beacon, red housing, 115VAC +/- 10%, 35mA, (specify color). ESS0042WX Xenon beacon, white housing, 115VAC +/- 10%, 35mA, (specify color). ESS0043RX Xenon beacon, red housing, 230VAC +/- 10%, 20mA, (specify color). ESS0043RW Xenon beacon, white housing, 230VAC +/- 10%, 20mA, (specify color). ESS0045LR LED beacon, red housing, 24VDC +/- 25%, 50mA, (specify color). ESS0045LW LED beacon, white housing, 24VDC +/- 25%, 50mA, (specify color). ESS0046LR LED beacon, red housing, 115VAC +/- 10%, 25mA, (specify color). ESS0046LW LED beacon, white housing, 115VAC +/- 10%, 25mA, (specify color). ESS0048LR LED beacon, red housing, 230VAC +/- 10%, 20mA, (specify color). ESS0048LW LED beacon, white housing, 230VAC +/- 10%, 20mA, (specify color).